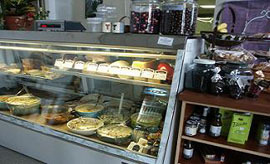 GC Cuisine was established in 1998. Karol started as a personal chef and with her unique style of low cal cooking the client base reached its peak. Soon discovered that many people wanted this service but did not like someone in there house or didn’t want the weekly service but liked the idea of daily service when they wanted it. This is where the idea of the deli came from. Everyone wonders what GC stands for, that simple Garden Chef since only fresh ingredients are used. We providing high quality foods convenient and fast for our clients. This is the best alternative to fast food. Home cooked meal that our low-cal and made fresh that day with only the freshest ingredients. Stop in pick up dinner, dessert and milk, wine or what ever you need to complete the dinner table.